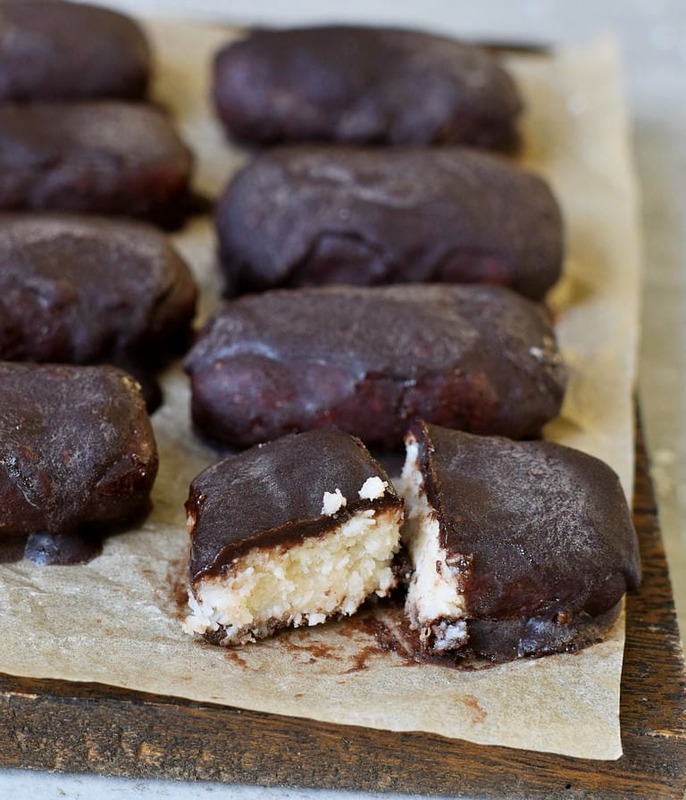 Coconut Chocolate Bars aka vegan Bounty bars! 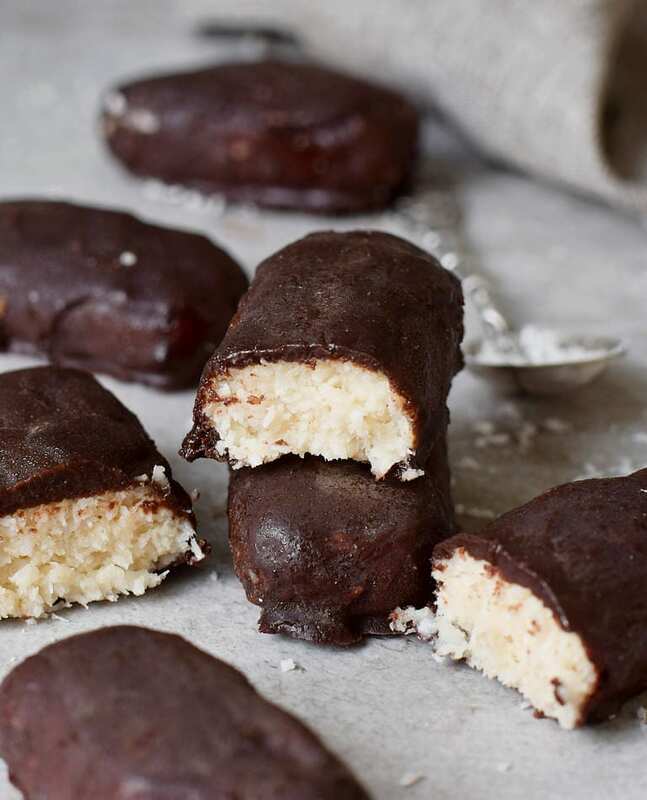 This delicious (almost raw) no-bake recipe is plant-based (dairy-free), and easy to make with only 7 simple ingredients. A delicious vegan dessert for all the coconut chocolate lovers out there! I have included a keto-friendly version in the recipe notes! I am probably the biggest coconut fan ever. Seriously, I adore coconut and I also adore chocolate. So the combo of both is heaven! As a kid my most favorite dessert was Bounty. These delicious coconut chocolate bars were always on our shopping list. Even as a teen I still loved Bounty bars. Once I went vegan I was quite desperate because I had to give up dairy (and therefore my beloved Bounty bars). However, there is probably nothing that we cannot veganize these days. Therefore I started experimenting in my kitchen and this was the result: Heavenly homemade vegan Bounty bars which are so mouth-watering! What exactly are Bounty Bars? A Bounty bar is a popular candy bar manufactured by Mars with a white, soft, sweet coconut filling which is covered in milk chocolate or dark chocolate. It’s pretty similar to Mounds bars! 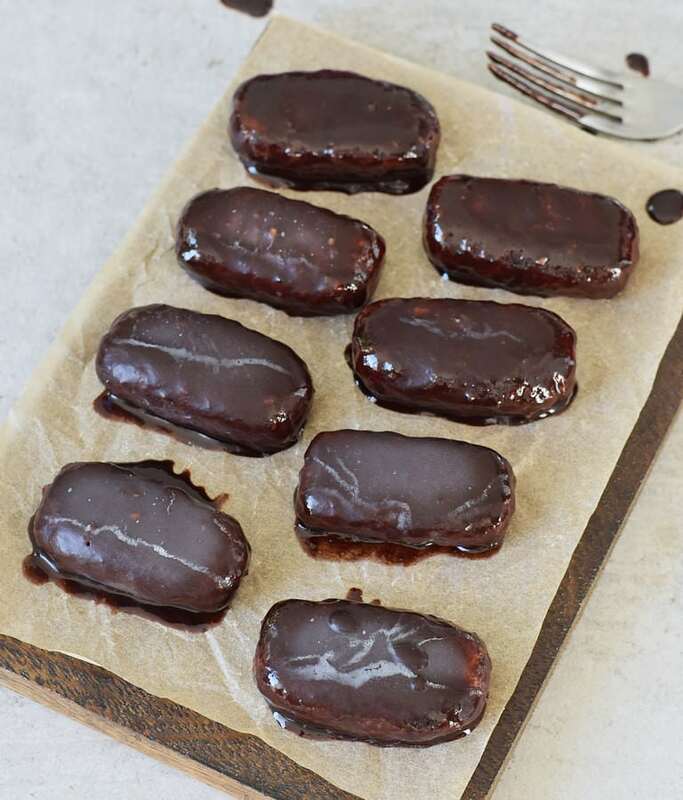 The chocolate of regular Bounty bars is not dairy-free but it’s super easy to make a vegan version. All you need is dairy-free chocolate chunks or chocolate chips which you have to melt. It couldn’t be easier. I love using these dairy-free mini chocolate chips and melt them with a teaspoon of coconut oil. However, sometimes I make homemade chocolate which is even keto-friendly (check the recipe notes)! 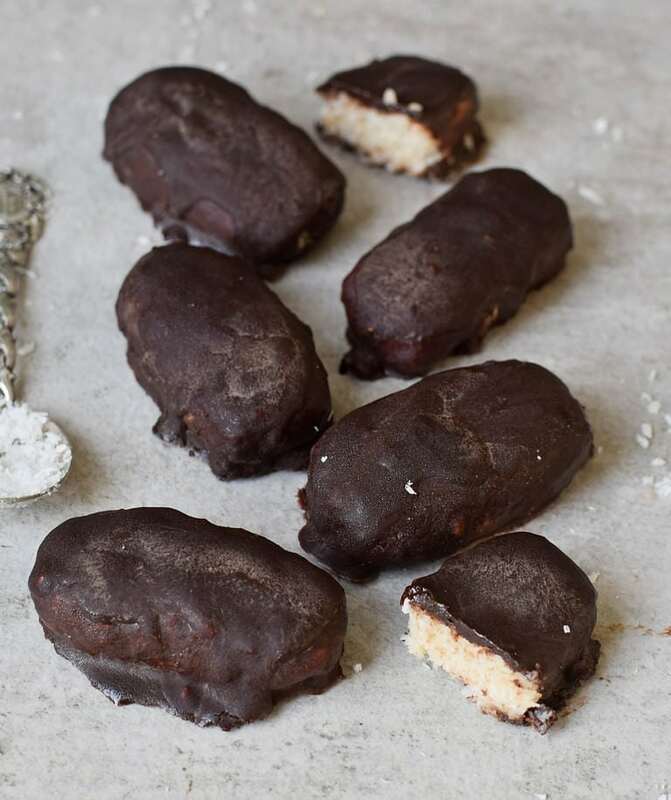 Yes, you can turn these homemade Bounty bars into a vegan keto recipe! I don’t have too many vegan keto desserts on my blog because I just love carbs, haha. However, this recipe can be made low-carb and keto-friendly. How? Simply make your own homemade chocolate without sugar! The coconut filling is already keto-friendly since I used Erythritol as a sweetener. You can also use Stevia but I personally don’t really like the taste of Stevia. Xylitol would be another low-carb option, even though it’s not zero carb (and zero calories) such as Erythritol. I love that these vegan Bounty Bars have a soft center. The center is soft because I didn’t add coconut oil or cacao butter. If you prefer a hard center then you should add 2 tbsp of cacao butter. You can also add coconut oil which will make the center harder (but not as hard as coconut butter). If you are just like me and love a soft center, then definitely leave out the oil! Another advantage of the soft center is, that you can enjoy them straight out of the freezer. You don’t need to thaw them and have a cool dessert which is perfect for the summer! 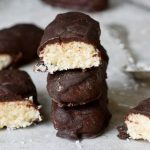 How To Make Homemade Bounty Bars? 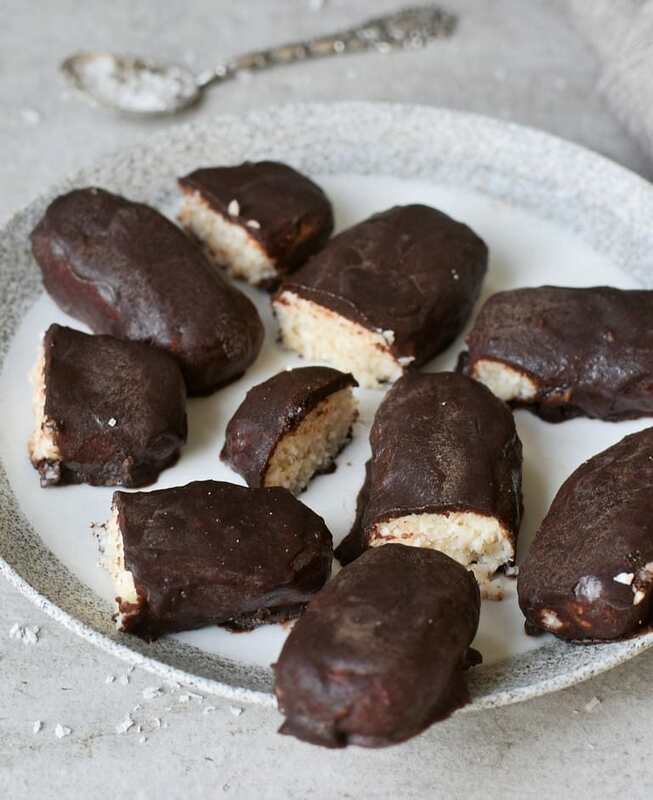 Making these homemade vegan Bounty bars is ridiculously easy! All you need is 7 simple ingredients and a food processor. Sounds easy right? I used an electric coffee/spice grinder to process the Erythritol. You could probably also use a food processor for this task. So, in the first step, you process the shredded unsweetened coconut with a pinch of salt and the Erythritol (or powdered sugar). Then you add the coconut yogurt and vanilla extract and blend again. Now you need to form bars with your hands and freeze them for at least 45 minutes (longer is better). Finally, you need to melt the chocolate and cover each coconut bar with it. Freeze again and enjoy! 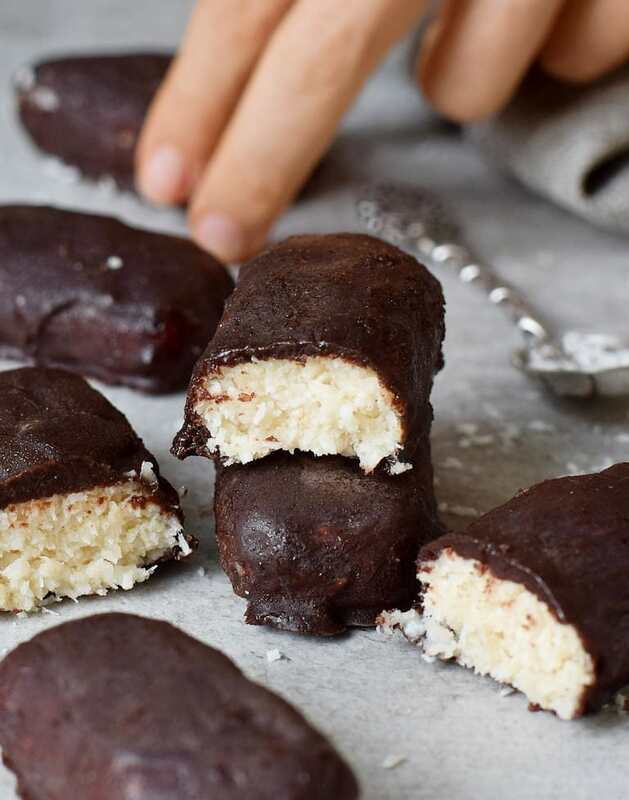 Should you recreate these coconut chocolate bars, please leave a comment below and don’t forget to tag me in your Instagram or Facebook post with @elavegan and #elavegan because I would love to see how your bars turned out! If you love coconut desserts, I am sure you will also love these Strawberry Coconut Bars and these Raw Coconut Cupcakes which are pretty similar! 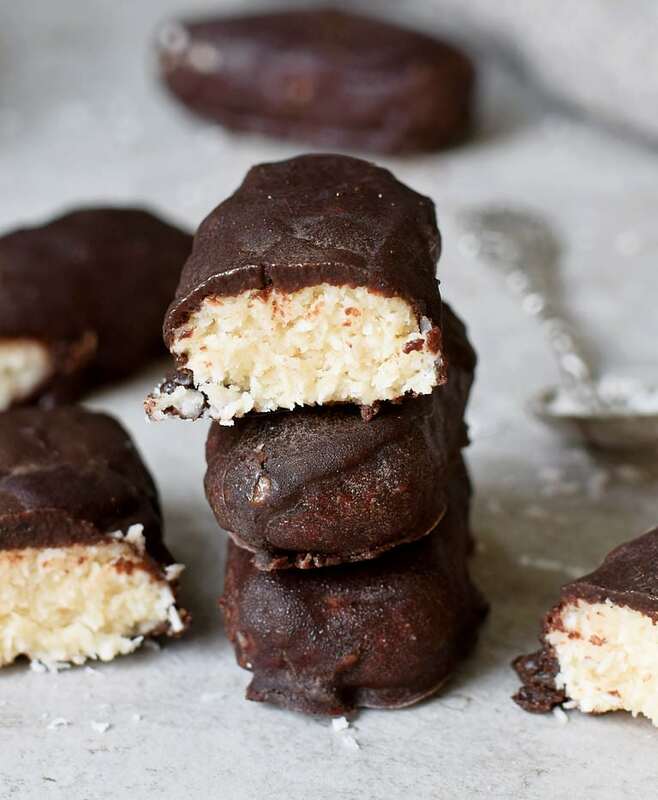 These homemade coconut chocolate bars (vegan Bounty bars) are the perfect dessert if you love coconut and chocolate. Only 7 ingredients and no oven required. This no-bake recipe is vegan, gluten-free, easy to make and can be made refined sugar-free, and keto-friendly (see recipe notes). Process the shredded unsweetened coconut, the Erythritol (or Xylitol or powdered sugar), and salt in a food processor. Blend for some seconds, then add the coconut yogurt and vanilla extract. Blend again. Scrape down the sides with a spatula or spoon and blend again until all the ingredients are well combined. If the mixture is too wet, add more shredded unsweetened coconut. If it's too dry, add more coconut yogurt. Take out about 1 heaped tbsp of the mixture and form it into a rounded bar (similar to the shape of bounty bars) with your hands. Do this until no coconut dough is left. 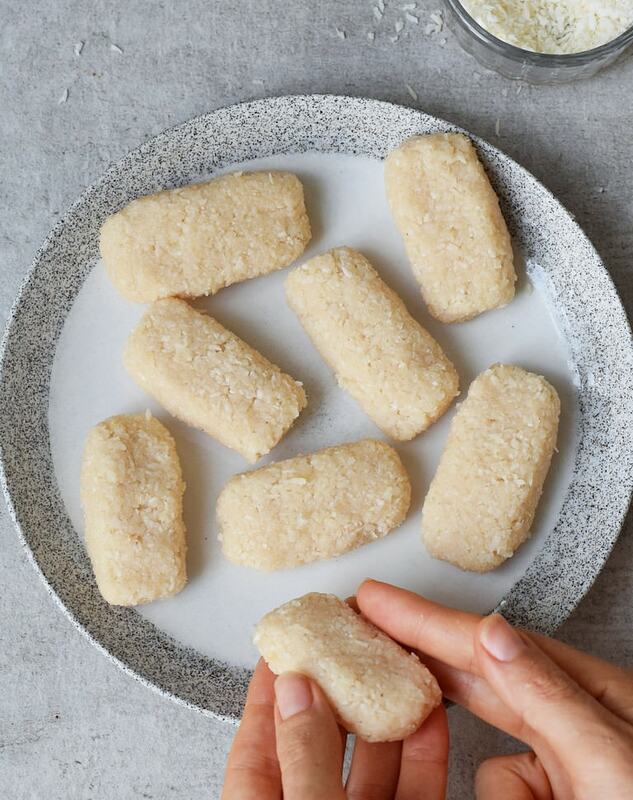 Place all coconut bars onto a plate and freeze for at least 45 minutes or until firm (longer is better). Melt chocolate with coconut oil in a double boiler (or in the microwave). 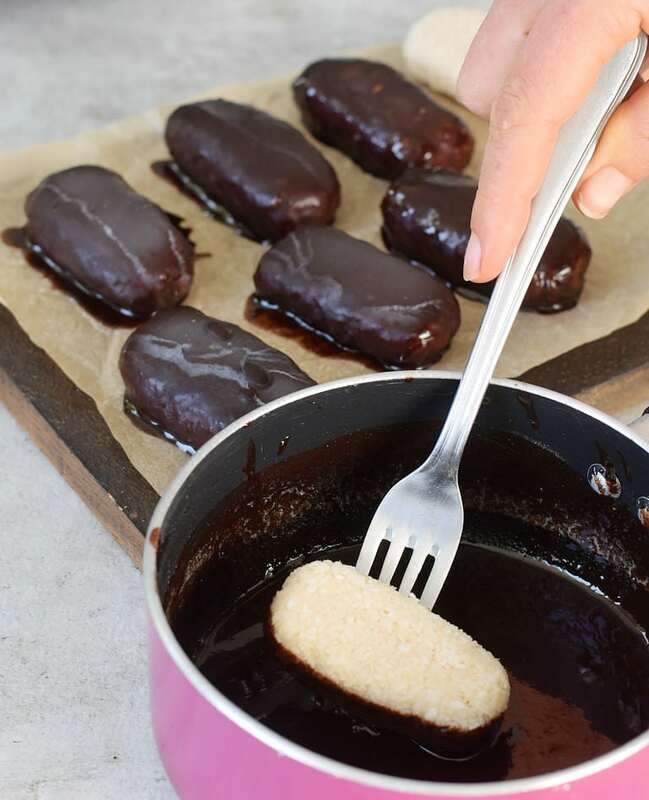 Dip each coconut bar into the chocolate sauce and freeze again for about 15 minutes. Store leftovers in the fridge or in the freezer! Enjoy! I used Erythritol as a sweetener. To make powdered Erythritol, simply process the granulated Erythritol in an electric coffee/spice grinder. You can use powdered sugar instead (for a non-keto version). You can probably use coconut cream (the hard part of a can of coconut milk after you put it into the fridge overnight) instead of coconut yogurt. Please note, that I haven't tried making this recipe with coconut cream but it should work just fine! The coconut center is pretty soft and the bars can be eaten right out of the freezer (don't need to be thawed). If you prefer a harder center, then add 2 tbsp of melted cacao butter to the coconut mixture. Instead of cacao butter, you could add 2 tbsp of melted coconut oil which would make the center a little bit harder. If you love a soft center, then definitely leave out the oil! Carefully melt the cacao butter and coconut oil over low heat in a saucepan (or in a double boiler), add the other ingredients and stir with a whisk. Done! Bounty bars are one of my all-time favourite sweets, and your version looks fantastic Ela! Great job, really looking forward to trying this soon! This is so good and very easy to make. I have to make double portion, because my family loves it! I also served my guests, and they were amazed of the taste. It’s better than bounty bars from the store, and healthy too!